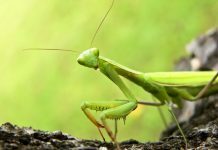 The caroline mantis (Stagmomantis carolina) or a caroline praying mantis is state insect of South Carolina. The mantis is primarily found in the North America including Illinois, Missouri, Arizona, New Jersey, Utah to as far as south as Mexico. 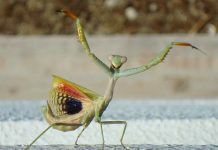 As is typical of a mantis only males can fly. They often come around street lights at night. Male mantis are thought to make pretty good flights. 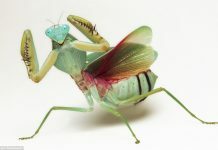 Perhaps you might like to read more Carolina mantis facts. Carolina mantis are typically recognized by their mottled grey appearance although they sometimes appear to be greenish-yellow in color. A few species has tannish-brown body. Adult mantis can reach an overall length of about 4 to 7 cm. They have comparatively bigger abdomen and head. 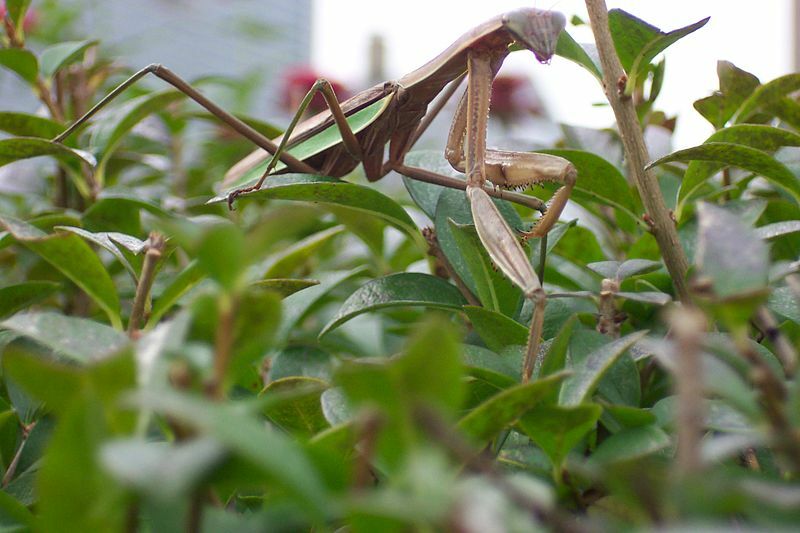 Carolina praying mantis possess raptorial folded forelegs one that contains spines. These forelegs are pretty handy against predators but they only use them as a last resort. The mantis likely raises its legs to get hold of a prey. They look like they are praying when they do this. The combined length of the head and thorax of a mantis is equal to the size of its abdomen. Like most other mantis, the adult female is bigger than the male. Therefore, the chances of cannibalism are greater. Males are also relatively slender and they have longer wings in comparison to females. The body size and the number of wings in males gives us the idea that only males are capable to take flight. Carolina mantis makes home in a variety of habitats such as meadows, woodlands, and scrub forests. Savanna, grasslands and scrub forests are the secondary habitats of a Carolina mantis. 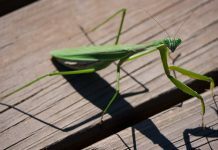 The Carolina praying mantis occurs all throughout the United States including Central America, North America, Panama, Venezuela, Trinidad, French Guiana. Belize, Suriname, Buenos Aires, and Costa Rica. All mantids are generally very good at obtaining their prey and so as the Carolina mantis. They sit and wait and wait for the prey to get within their striking distance. As the prey gets closer, the mantis grabs it with its neck just like a lion or tiger. Since the Carolina mantis fancy living near flowers they would grab any bug that visits the flower. They do not stalk their prey. carolina do chase ants but only sometimes. 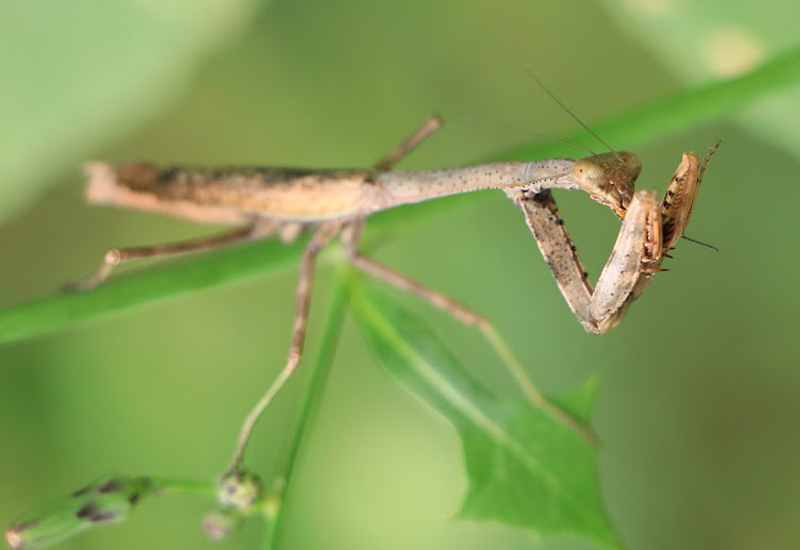 The Carolina mantis largely feeds on arthropods but they also supplement their diet with frogs and lizards. Carolina praying mantis prefer to live a sedentary lifestyle. They will stay in the same tree all day long provided they have sufficient food to feed on. 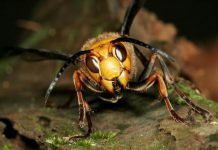 During summer, adult males move around just a little looking for females. They are mostly most active at night. They are able to detect high-frequency sounds emitted by bats and thus they often drop to the ground if they hear bats’ sounds. The female mantids are known to attack and eat the male during mating. While they do cannibalize their mating partner but they don’t behave the same way in the wild as they do in the laboratory. 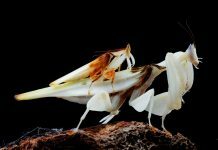 Scientists believe that mantis just don’t always feed on their partner and much of the information regarding cannibalism is exaggerated. The female dies after laying eggs and the eggs hatch in the following spring. It will deposit the eggs on plant stems. Teyssier, J. Jul/Aug ’97. The Devil’s Riding Horse. Canadian Geographic, 117: 44-50. Gary Watkins and Ric Bessin. “Praying Mantids”. University of Kentucky College of Agriculture. Retrieved 2008-01-24.